What a night Friday the 13th turned out to be as five ranked teams fell in Week 2 of the Kansas high school football season. No upset was bigger than the Maize Eagles shocking 5A No. 1 Salina South, 40-28. After the Eagles and Cougars played to a 14-14 first half tie, Maize quarterback Connor Lungwitz took over. The junior led Maize on two third-quarter touchdown drives to build a 27-14 lead entering the fourth quarter. Salina South responded with a 47-yard touchdown pass from Justin Stonebraker to Zach Nachbar to pull within 27-21. Lungwitz would answer with his fourth touchdown pass of the night, this time to Colton Helm to give the Eagles a 33-21 lead with just 1:14 remaining. It took the Cougars just 21 seconds to respond as Stonebraker connected with Nachbar again, this time for 79 yards, to pull South within 33-28 with :53 seconds left. Maize recovered the ensuing onside kick and shortly after put the game away as Chase White burst around the right side for a 48-yard, game-clinching score. White finished with more than 150 yards rushing and that final touchdown. He also caught four short passes including a third-quarter touchdown that gave the Eagles the lead for good. Lungwitz completed 22 of his 30 pass attempts for 146 yards and four touchdowns. Maize held Salina South’s Mike Jones to approximately 75 yards rushing on 20 carries. The fans choice for Kpreps Game of the Week takes us to the Frontier League where 4A No. 5 Baldwin hosted traditional power Paola. Paola grabbed an early lead on a blocked punt and safety. It didn’t take the senior-laden Baldwin Bulldogs much time to respond. Quarterback Chad Berg contributed three touchdowns in the second quarter as Baldwin built a 21-2 halftime lead. Berg scored on touchdown runs of 42 and eight yards, while tossing a 25-yard scoring strike to Luke Fursman. Baldwin extended its lead to 28-2 in the third quarter on a 7-yard touchdown run by star tailback Cornell Brown. Paola would add a fourth-quarter touchdown pass from Andrew Henn to Mitchell Sloan , but it wasn’t enough as the Bulldogs prevailed 28-9. The win keeps Baldwin unbeaten in the tough Frontier League along with two-time defending 4A runners-up Eudora and surprising Ottawa. Eudora’s Andrew Ballock scored from 7-yards out in the fourth quarter to lift the Cardinals to a 16-15 win over rival Louisburg. Ottawa outlasted De Soto 13-10 in two overtimes to improve to 2-0. The teams were tied at 7 at the end of regulation, and both committed turnovers in the first overtime. De Soto managed a short field goal in the second overtime to take a 10-7 lead. Ottawa freshman quarterback Isaac McCullough tossed a short touchdown pass to Kord Ferguson to give the Cyclones the 13-10 win. Madison survived another test from a ranked opponent as the Bulldogs outlasted No. 3 Marais des Cygnes Valley, 36-22. The Bulldogs and Trojans were tied at 22 heading into the fourth quarter. In the final period, Madison’s Owen Reed scored on a short touchdown run to give the Bulldogs a 28-22 lead. On the ensuing possession, Marais des Cygnes fumbled on a fourth down attempt in their own territory. Madison’s converted the turnover into a Sage Blubaugh touchdown run and a 36-22 lead. Madison’s Dallas Thompson and MdCV’s Kaden Vanderpool each rushed for about 100 yards in the game. These two teams are strong contenders in 8-Man, Division I. It wouldn’t be surprising to see them meet again in the playoffs. Topeka Seaman outlasted Junction City 21-20 in overtime in the Cox Friday Night Live game of the week. The Vikings scored first in overtime to take a 21-14 lead, but Junction City answered with a touchdown of its own. The Blue Jays elected to go for the two-point conversion and the win, but the Vikings stuffed the conversion run to secure the one-point win. The Thursday night schedule also included a feature game as 5A No. 5 Bishop Miege traveled to No. 3 Blue Valley. The Miege Stags forced five Blue Valley turnovers, including a decisive 15-yard pick-six by Keegan Wilson, and beat the Tigers 24-15. Quarterback Ryan Willis threw for nearly 300 yards and a pair of touchdowns to pace the Stags. Wide receiver McKinley Johnson hauled in 160 receiving yards and a touchdown from Willis. Blue Valley will try and rebound next week when they travel to take on No. 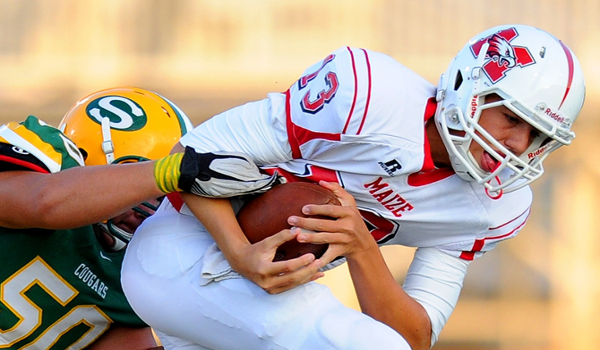 1 Salina South – which was upset by Maize on Friday night. Finally, the top two teams in the CNC and SEK League preseason polls squared off on Friday night as Columbus (CNC) traveled to Fort Scott (SEK). Justin Foust connected on a 27-yard field goal as time expired to lift the Columbus Titans to a 15-14 victory over the Tigers.